Check out this episode of the podcast AI at Work to hear from our CEO, Adam Martel. He talked about the progress we’re seeing with AI in the Advancement industry, founding Gravyty, and more with AI at Work’s host and Talla’s CEO Rob May. Here’s a sneak peek at some of the biggest takeaways Adam shared with Rob. We see it in Advancement shops around the country – frontline fundraisers who are hired to build relationships that move the needle for their organization. However, the majority of their days are spent in databases and processes to determine which potential donor to reach out to. Adam and Gravyty co-founder and CTO Rich Palmer realized that AI and machine learning techniques could be applied to much of the data that nonprofit organizations and higher education institutions house to mimic the cognitive functions of a seasoned fundraiser and predict which potential donors are most important to reach out to now – allowing teams to focus attention on the right donors. For any technology to deliver real value, people need to use it. People need to use your technology in order to benefit from it. If you want people to use your technology, you have to understand how they work and meet them there. To learn more from Adam on tips to executives learning about AI, predictions on the future of AI, new partnerships, and much more tune in to this episode of AI at Work or read the full transcript. 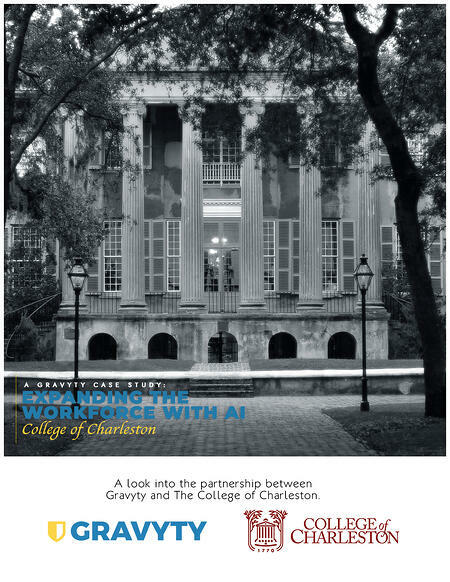 And, if you’d like to see how Gravyty expanded the fundraising workforce for The College of Charleston by 160%, have a look at our recent case study, below.